Take a quick inventory for possible harm to everyone in the vehicle, especially children. Call EMS if needed. Contact local law enforcement, who will send an officer to make a vehicle accident report. Do not leave the accident scene before the law enforcement official arrives. Avoid discussion with the other driver except to exchange insurance information. Keep everyone off the road, either in the vehicle or beside the road to avoid oncoming traffic. If possible, use a smartphone to take pictures of your vehicle and any other damage at the scene, such as fencing or telephone poles that were involved in the accident and road condition, like construction, if relevant. Stay calm and provide detailed responses to the police officer who is making the report. If anyone has a non-emergency injury, drive your car if it is drivable or use another transport means to take the person to the hospital to check for injuries that may less noticeable. Some injuries do not appear to be serious but can be, such as a bone fracture or internal organ damage. Injured persons' symptoms will be assessed and perhaps tested, after which any recommended treatment will be prescribed. After leaving the hospital ER, follow through with medical recommendations to see the family doctor or a specialist for more in-depth evaluation, if needed. If someone has been injured in the accident or it was a serious crash with significant damage, contact an attorney to discuss the legal implications. Attorneys working for a major personal injury law firm, like Pines Salomon injury lawyers, can provide valuable information about filing a claim for resulting costs and obtaining compensation from the responsible party. This may take time, and the attorney might ask you to forward medical records, an accident report, and other documentation related to car repairs and additional costs for substitute transportation, lost wages, and other accident-based expenses. Maintain records and receipts stemming from the accident, including medical bills, tests and examinations, and treatment costs. The attorney can also explain the statute of limitations and other applicable laws that govern personal injury litigation. Make necessary arrangements to deal with the aftermath of the collision. Contact jobs and schools to provide explanations for absences if warranted, and arrange to provide the required medical excuses needed. Take the car to the repair shop for an estimate, and consider getting a couple of estimates to compare services and pricing. You may need to wait and hear from the responsible person's insurance adjuster before scheduling auto repairs. Arrange alternate transportation until the vehicle is fully operational. 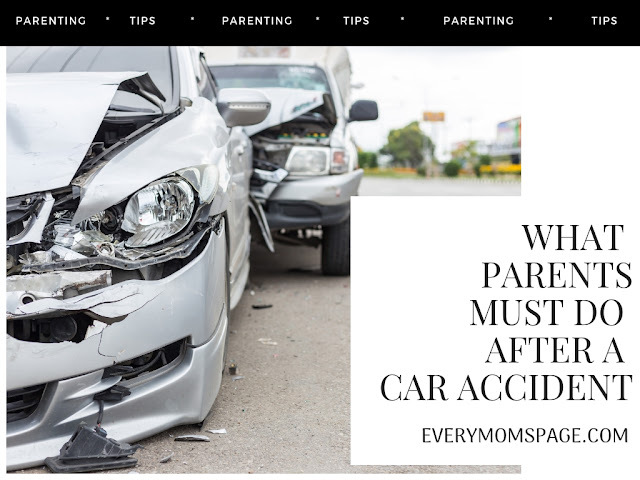 Although car accidents are not uncommon, they can be especially traumatic when children are involved. Take these important first steps to protect your family if an accident should occur. Make sure they are medically monitored and treated as needed. Arrange for alternate transportation if the car cannot be driven. Obtain medical excuses for work and school that will be missed. Contact a personal injury attorney to discuss the potential for seeking compensation for damages.